Slide gate operators are a complement to any cantilever gate hardware system. These electric or solar power openers for sliding gates work well with DuraGates hardware. We are certain you will find a gate opener to suit your needs ranging from residential to industrial to commercial applications. Our Gate Automation Guide is a great resource for slide and swing gate automation. We've created our guide, with you, the client in mind. Included in the guide is the DASMA safety guide to ensure you understand the importance of choosing the correct safety devices for your gate. We showcase our gate operators along side suggested accessories to make the selection process easier. We also feature additional access control, driveway loops, switches and locks. Please download the guide today to help you choose the components for your next application. The smallest gate operator, the Deimos, is for residential sliding gates up to 1,100 pounds. 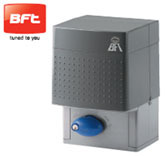 We sell the Deimos in a kit which includes a Deimos BT UL/CSA automatic slide gate opener from BFT, one MITTO2 two-channel rolling code transmitter that is compatible with the operators built in rolling code receiver and a set of FL 130B photocells. The Deimos offers smart technology features such as electromechanical microswitches that control the end of stroke, an incorporated two-channel rolling code radio receiver, and a self contained control panel unit with self-learning and self-diagnostic functions. 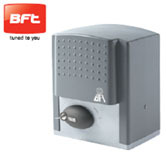 The BFT Ares 1500 gate operator, a more “medium-heavy” model, works well with robust ornamental iron and/or industrial sliding gates as the leaf weight limit is 3,300 pounds. The 24v electrical motor guarantees maximum accuracy in torque and speed control and makes it suitable for intensive gate use, even in industrial installations. 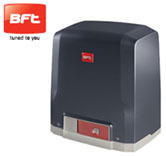 The ICARO FAST model by BFT is a sliding gate operator for intensive use. It is extremely sturdy and its exclusive torque control system gives complete control over safety. Thanks to the obstruction sensing device, the operator reverses motion and prevents damage to people and vehicles in the event of contact. 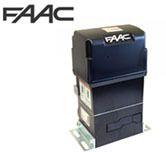 With a maximum leaf weight of 4,000 pounds and gate speed of 38ft/min, Model 844ER rolling gate operator by FAAC is the clear choice for commercial/industrial applications. This operator offers maximum anti-crushing safety with a twin-disk oil-bath clutch and electronic board with encoder for reverse on obstacle. SLIDING GATE LOCK – where security is required but gate automation is not needed. 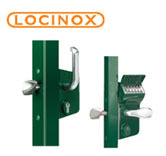 For applications where gate automation is not needed, but security is required, we offer a sliding gate lock by Locinox. This slide gate lock for manual sliding gates has an aluminium housing and stainless steel mechanism. The dead bolt is used to override the code panel and secure the gate. The unique Twistfinger catch bolt and auto-correcting keep ensures latching of your sliding gate. Catch bolts are available to fit gate frame profiles from 1-1/2” to 4” wide. Works with cantilever gate systems or fixed roller systems.